Fondante d'Automne is an old-fashioned 19th century French pear variety which has been grown in England since Victorian times. 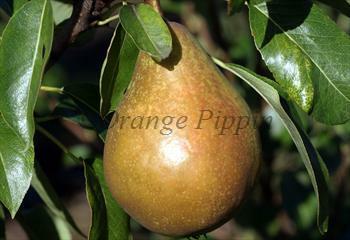 Its name describes it well - this is a late-season pear with a sugary sweet flavour. For best results, as with most pears, pick the fruits before they are fully ripe on the tree and ripen in a fruit bowl. Please fill in the details below and we will let you know when Fondante d'Automne pear trees are back in stock. Fondante d'Automne is in flowering group 4. Fondante d'Automne is self-sterile and needs to be pollinated by another tree of a different variety nearby. Unlike many pears of French origin, Fondante d'Automne fruits reliably in the English climate, and is not susceptible to the usual pear diseases. Fondante d'Automne is known to have existed in France in 1825 and is probably somewhat older. It is typical of a number of pear varieties from this era which are named "fondante" and are characterised by their particularly sweet rich flavours.